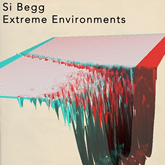 Extreme Environments is a free, download-only album from former NovaMute artist Si Begg made available through the Soundcloud platform. The album is instantly more sonically intricate than Si Begg’s last album proper, 2013’s Permission To Explode, showcasing a strand of brutal ambience across its ten short tracks. Howling drones, glitches, crisp static and ominous tones are responsible for giving this a largely threatening tone, offset by occasional periods of reflection and slowly-evolving, heavily-shrouded melody. ‘Location 4’ almost sounds like a finely wrought piece of minimalist composition or the soundtrack to a particularly harrowing scene from a Darren Aronofsky flick, while the tranquil euphoria of ‘Location 6’ could be a missing track from Brian Eno’s The Shutov Assembly. Since departing NovaMute, Si Begg has made a name for himself as a commercial composer for advertising and other media. Such a career move inevitably requires a degree of flexibility and the ability to switch between styles on a whim. Whilst ostensibly an ambient giveaway, Extreme Environments nonetheless highlights that Si Begg can turn his hand to more or less anything with an equal sense of space and depth. Read more about Si Begg’s Extreme Environments sample library and Kontakt instrument here. Download the free Extreme Environments album from Soundcloud here. Stay tuned to Si Begg’s YouTube channel for a series of videos to go with the album. To celebrate the announcement of the new Erasure album yesterday, I thought it was probably high time to take a proper look inside the box of their last album, 2013’s Snow Globe. Specifically, I thought I’d raise a glass to The Violet Flame by mixing one of the Erasure song-themed drinks included in the novelty cocktail booklet that came inside the Snow Globe box. Alongside my love of all things Mute, another of my interests is making cocktails. I don’t say that as code for enjoying getting drunk – far from it; I’m not good at that at all – but rather I genuinely enjoy the process of taking ingredients, following recipes and mixing interesting drinks. I selected the Blue Savannah, named in honour of the third single taken from Wild!, for two reasonably sensible reasons; first because I happened to have all of the ingredients in the house already, and second because Mrs S tends to prefer longer, juice-based cocktails. The Blue Savannah is a vodka-based drink mixed with blue curacao, orange and pineapple juices which is then strained into a highball glass over ice. Anyone with a rudimentary grasp of colours will know that mixing blue with orange will produce a greeny, almost turquoise hue, and so it is with the Blue Savannah, as can be seen in the photo. Pineapple juice, when shaken and strained, produces a velvet foam (as does egg white), hence the ‘head’ that’s visible on the drink. Curacao is a liqueur made with a bitter, orange-esque fruit called lahara. When mixed with sweet juices as it is in this drink, curacao has the effect of cutting through sweeter flavours and toning down fruit sugars. Plus, in the case of blue curacao, it naturally adds a distinctive colour to proceedings. Not being a fan of really sweet cocktails, I really liked the addition of some bitterness. Mrs S was less convinced, saying that something in the drink was bothering her throat. I will ultimately work my way through the other cocktails in the book over the next few months. I’ll even tackle the Love To Hate You, a challenging drink that includes Marmite alongside fruit flavours. Released in 1992 between Depeche Mode‘s Violator and Songs Of Faith And Devotion, Recoil‘s Bloodline found Alan Wilder collaborating with Moby, covering The Sensational Alex Harvey Band’s ‘Faith Healer’ with Nitzer Ebb‘s Douglas McCarthy and deploying the vocals of Curve’s Toni Halliday; nicking swathes of vocals from bluesman Bukka White, and even dropping in a spoken word prayer from Diamanda Galas. Unlike Wilder’s previous two releases as Recoil (1986’s 1+2 and 1988’s Hydrology), Bloodline showcases a more uptempo, song-based album; whilst his painstaking studio endeavours and long-form sound designs are in evidence across Bloodline, what emerges is an album that benefits from having the various vocalist contributors add their respective sections, even if at times it’s more pop than one might have expected. Then again, if there was one criticism of Wilder’s two previous releases, it was that they didn’t fit into any particular electronic genre – too pop to be ambient and too organic at times to be suited to the electronic music purist; clever, certainly, but somewhat impenetrable. I like to think that Recoil showcases a certain ‘big budget’ electronic music. It’s the difference between a big Hollywood picture with all the special effects you can imagine and a tiny indie flick. Sonically, it feels like Wilder had access to all the best kit and equipment because of his role in one of the biggest bands in the world; in the hands of a bedroom-confined electronic musician the result would have been different and perhaps a little edgier, a touch grittier maybe. According to Wilder’s helpful Q&A on his website, the reality was somewhat more toward the ‘small’ end of the studio spectrum compared to his later studio, with Bloodline put together in the back room of his London home. Nevertheless, Bloodline still has a glossy high-end sheen to most of the tracks. One of the most surprising (and most adventurous) tracks is ‘Curse’, which features Moby – at this point still in his pre-Mute Instinct days – rapping desperately about social and moral issues. I say surprising, because Moby hasn’t ever been known as a rapper; he’s clearly dabbled in a whole spectrum of different musical genres from ghostly ambient stasis to thrash metal but actually rapping remains something of an oddity. To confound things yet further, ‘Curse’ finds Moby’s vocal pitch-shifted downwards, giving his contribution a dark, aggressive quality, even if it means that his voice is unrecognisable. Wilder drops in slowed-down wheezing sounds, beats that sound like they originate from a steam-powered production line and liquid electro bass riffs. In keeping with a number of other tracks on Bloodline, ‘Curse’ is lengthy, the second half here being dominated by a more robust beat and samples of a manic orator delivering a religious protest speech. ‘Electro Blues For Bukka White’ proves categorically that Moby’s sampling of old blues records and hitching them to more modern soundscapes wasn’t necessarily all that innovative on Play, Wilder here doing the same with lengthy a cappella section of White’s vocal while a throbbing electro rhythm and some meditative bass noises drift along underneath. At times it feels like Depeche’s ‘Waiting For The Night’ from Violator only with a more pronounced beat. Neat symphonic strings add an unexpected emotional quality to this song, highlighting just how adept Wilder has always been at forcing out the emotions in a song. A similar effect is achieved on the closing track, ‘Freeze’, which has an austere sound, not dissimilar from some of Wilder’s more grandiose classically-informed work with Depeche at the time of Music For The Masses. One of the best tracks on Bloodline is ‘The Defector’, a pulsing and mostly instrumental electro track that was Wilder’s self-confessed homage to Kraftwerk; that’s certainly evidenced in the thippy electronic sounds and clattering industrial beat reminiscent of Trans-Europe Express-era Kraftwerk. That said, ‘The Defector’ retains a robustness to its rhythms and synths that Kraftwerk have never quite been able to deliver. The two tracks featuring Toni Halliday (the languid ‘Edge To Life’, mooted as an ultimately abandoned second single, and the harder ‘Bloodline’) are among the most ‘pop’ tracks here, Halliday’s strained vocals for some reason getting a little too close to Madonna for comfort. Wilder’s backdrop, particularly on the twitchy ‘Bloodline’ has an edginess, an definite apocalyptic tone, but on the whole, while they’re undoubtedly clever sonically, there’s something vaguely disappointing about these two songs that I can’t quite put my finger on. ‘Bloodline’s saving grace is the dense middle section featuring lots of wordless singing from Halliday, dubby guitar plucks a la ‘Policy Of Truth’ and all sorts of drama, not least from Jenni McCarthy (Doug McCarthy’s daughter) who provides an unsettling vocal section. Bloodline also includes two unnamed link tracks, one between ‘Electro Blues For Bukka White’ and ‘The Defector’ and one between ‘Curse’ and ‘Bloodline’. The former is a short atmospheric piece with a threatening, claustrophobic quality, a little like being surrounded by looming clouds of noxious electronics; the second features a heavily-processed Diamanda Galas delivering the Lord’s Prayer, creating a similarly unsettling effect. Galas’s religious contribution, whether you can make it out or not, as well as the occasional use of preacher samples, highlight a vague theme that exists at various points during Bloodline. The album’s sequencing, from the possessed sounds of a man speaking in tongues at the very start of ‘Faith Healer’ through to the redemptive, elegiac sound of ‘Freeze’ creates the impression of someone moving from darkness to light, a theme that Wilder’s bandmate Martin L. Gore would use to devastating effect time after time in his writing for Depeche Mode. If anything, Wilder’s approach to enlightenment and salvation on Bloodline is more subtle and somehow all the more dangerous for it. I bought this album whilst on holiday in Southend-on-Sea during Whitsun week in 1992, a few weeks before my mock GCSEs, along with Mute’s International compilation and Nitzer Ebb’s Belief. As it’s Whitsun this week, I decided to head down memory lane and re-post this review from 2012. Thanks to Andy, Lyn and Jonathan for their help with this review. Erasure release their new album, The Violet Flame, on 22 September through Mute. Listen to an extract from a new track from the Richard X-produced album via YouTube. The album will be released as a CD, 2CD, download and obligatory, financial destitution-ensuring boxset and will be accompanied by a global tour. Erasure re-recorded what might well be their signature song, ‘A Little Respect’, in 2010. Released as a one-track download, the single was issued in support of the Hetrick-Martin Institute, a New York-based non-profit organisation for lesbian, gay, bisexual, transgender or questioning (LBGTQ) youths between the ages of 13 and 24. 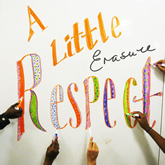 ‘A Little Respect’ has always had an anthemic quality, whether in the hands of Erasure themselves or in the likes of Wheatus or the many other acts who have subsequently co-opted the song for themselves (and there are plenty). At its heart is a simple, understated message of defiance and a polite demand for equal treatment. As a spirited call to respect a person just because they don’t fit in, have a different sexual orientation, a different belief system or any number of personal values that might not quite fit with the homogeneity that is the so-called ‘norm’, ‘A Little Respect’ has a universally simple appeal and it lends itself perfectly to HMI’s laudable goals. It’s an organisation that Erasure’s Andy Bell is a major supporter of, hence the re-worked version of the track that he and Vince Clarke put together – aided by the Hetrick-Martin Institute Youth Chorus – with proceeds going to the charity. Fans of the original Stephen Hague-produced track will no doubt bemoan the springy, updated new arrangement (which ditches Vince’s guitar in favour of a crisper beat and shimmering electronic palette), but Andy Bell could probably sing this backward and it would still sound just as uplifting. The addition of the choir inevitably reminds the listener of the crowd at Rangers who seem to have co-opted the track as an unofficial anthem, but some deep soulful ad libs at the very end brings this right back into the warm nod to Motown that many of the tracks on The Innocents carried. More information on HMI can be found here. A video for the single was released and can be viewed below. 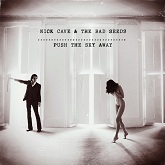 Push The Sky Away is the first Nick Cave material to emerge since he parted company with Mute in the wake of his terminated Grinderman project, and the first Bad Seeds album since 2008’s Dig!!! Lazarus Dig!!!. Now bereft of long-term arranger Mick Harvey, the Dirty Three multi-instrumentalist Warren Ellis steps in and takes the role vacated by Harvey; since 2007 Ellis’ playing has filled the void left by Blixa Bargeld‘s guitar, he was Cave’s foil in Grinderman and the pair have realised several soundtracks together, showcasing a symbiotic relationship that has produced some of the best material in Cave’s back catalogue. It’s precisely thirty years since the volatile young Nick Cave formed The Bad Seeds in Berlin following the demise of post-punk’s ravaged Birthday Party. Much has changed. Aside from a surprise reappearance of original Bad Seeds bassist Barry Adamson on two tracks here, not one of the original Bad Seeds line-up features in the group that bears the name today, but the core group of musicians that have been with Cave the longest remain in situ – Warren Ellis, Jim Sclavunos (percussion), Thomas Wydler (drums), Martyn P. Casey (bass) and Conway Savage (piano, organ). The fire and brimstone seems to have been exorcised effectively by two raucous Grinderman records and the Dig!!! Lazarus Dig!!! album in the middle, leaving Cave and co focussing more or less completely on the beautiful melancholia of the more serene moments of Abbatoir Blues / The Lyre Of Orpheus. That sense of the ‘new’ comes through in the remarkable palette of sounds deployed on the album, much of it purportedly derived from loops prepared by Ellis. With Mick Harvey gone and Cave seemingly unwilling to pick up a guitar after Grinderman, the album is largely devoid of any six-string action, with only the stand-out ‘Jubilee Street’ carrying anything close to a guitar line. Ellis shines through as effective lead musician, tracks filled-out with his loops, violin, mandolin and other assorted instruments. The rest of The Bad Seeds literally seem to play second fiddle to the dominance of Ellis, offering up loping basslines, intricate percussion and sprinkles of beautiful piano. Nevertheless, it’s reasonably clear – and not necessarily a bad thing – that Ellis is the primary mood-maker here. The upshot is some of the most advanced music that the Bad Seeds have ever realised, often bordering on a sort of synth music offshoot that no-one has named yet. Cave’s singing has matured into a distinctive, varied and considered voice over time. The rough edges are all completely gone, leaving a honey-coated rasp that feels a long way from the guttural bleatings of the Cave of the past, hunched over a microphone in apparent pain, spitting words and sibilant sounds forth like a man possessed. The pretty ‘Wide Lovely Eyes’ Cave – with Cave observing the funfare being dismantled and images of departure set to a backdrop of shoes being arranged carefully on a pebble beach – sees the beautiful pairing of Cave and Conway Savage reminding us of some of the most brittle moments of the Bad Seeds catalogue, wherein the tenderness long ago replaced the anger; on this and a number of other songs, Cave reminds me of Ed Harris’s character in The Hours, sat in his window watching the world go by, a resigned, tired air colouring proceedings. The frontman reprises some of his humourous bluesy story-telling and diverse intonations on the obscure centrepiece, ‘Higgs Boson Blues’, namechecking everything from Hannah Montana / Miley Cyrus, Wikipedia, Robert Johnson, vague mythologies and Switzerland’s Large Hadron Collider; that and ‘Jubilee Street’ are the clear highlights of the album, both being the most fully-formed and musically complete pieces here. The former has a skittish, absorbing jazz-blues dimension; the latter has a rousing, slowly-developing mix of lovely rolling drums, acoustic guitar, percussion, full orchestration and a muted intensity as Cave rises up into the sky toward the end in angelic contrast to the devilish way he flew forth in ‘Mutiny!’ back in the day. ‘Jubilee Street’ (which may or may not be set on the much-altered street in Brighton now devoid of any of its original charm) has a strong and compelling narrative, touching on the darker side of life with a bleak tale of what sounds like a prostitute who gets moved on from Jubilee Street by Russians. The rest of the album is sonically clever and absorbing, even if Cave sounds like he might be sleepwalking through his songwriting at times. Nevertheless, he’s managed to produce some truly lovely songs as well as a new-found observational capacity in tracks like ‘Water’s Edge’, wherein the opposing forces of London girls looking for a good time and local boys looking for something to do clash; like Quadrophenia for vampires and party girls. There’s also moments where his particular brand of Viz-style smuttiness and wry humour shine through. Overall, it feels like Laura Ashley wallpaper – nice to look at, perfectly inoffensive and fine in the background, but you wouldn’t decorate your whole house with it. Thanks to Rhian at Big Mouth. I’m reposting this on the occasion of the Push The Sky Away receiving the prestigious Ivor Novello Album Award, an incredible achievement for both Nick Cave and his publisher Mute Song. Cave has deserved greater recognition for his songwriting for far too long, and I’m delighted that the rest of the music world seems to have caught up with those of us who always knew where his songs would ultimately take him. I just wish that it had been another album that had secured him that recognition; a year on, I still haven’t warmed to this album, and I personally feel that there are far better works than this in the Cave back catalogue. Erasure‘s 1994 album found Andy Bell and Vince Clarke getting warm and tender. Compared to the previous album, Chorus, which had a grit to its analogue construction, the oddly named I Say I Say I Say – whose electronic backdrops were again created entirely using retro synths – has a serene, enveloping tone. Andy’s lyrics too veer toward the affectionate and romantic. Rightly or wrongly, I like to think of this as Erasure’s album of love songs, eschewing some of the more wordly-wise themes of the previous albums. Curiously, this is also the Erasure album I have listened to the least. I put this down to the limited edition CD that I bought – a beautifully-designed 12″ box with a pop-up fairytale castle with the CD itself intended to look like a shimmering lake at the foot of the castle, everything swathed in shades of blue from a gibbous moon. Great idea, but it meant that this got stuck in a box with my vinyl for safekeeping, rather than being accessibly on the shelf with my other CDs. ‘Fairytale’ is not a bad description for this album, as producer Martyn Ware (ex-Human League and Heaven 17 and future project partner of Vince as The Illustrious Company) wraps a dream-like, sommnambulent atmosphere around many of the songs, particularly those featuring St. Patrick’s Cathedral choir (‘So The Story Goes’ and ‘Miracle’). 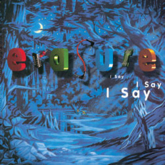 I Say I Say I Say yielded three singles – the gorgeous ‘Always’, the chart success of which Erasure would not match until 2005, ‘Run To The Sun’ and ‘I Love Saturday’ – but sadly marked the start of a long period of poor singles success for the duo. ‘Take Me Back’ has a beautiful, extended introduction, which unfolds into a multitude of cascading melodies, Andy delivering a strident, impassioned vocal, wishing to return to the safety of his childhood. There is a brief section where the layers are sloughed off, leaving an intricate drum pattern built of springy, metallic synth sounds and what can only be described as a distorted attempt to replicate vinyl scratching using a synth. ‘Man In The Moon’ runs in waltz time and includes some almost classical keyboard work (albeit an elastic synth rather than piano or harpsichord) and a melody played on a flute-esque synth, while Andy delivers a cosy, romantic lyric. The track concludes with Andy singing solo over what sounds suspiciously like the tinkly opening bars of the Velvet Underground’s ‘Sunday Morning’, and overall this track has a quirkily similar, enveloping sound. ‘So The Story Goes’ is another waltz, and the first to feature the choir. Andy’s vocal is full and theatrical, while Vince offers a deep bassline similar to Chorus‘ ‘Turns The Love To Anger’ and flutters of synth arpeggios. Andy delivers a solo monologue at the end of the song, while the choir achieve an atmospheric discord that is as much mysterious as it is chilling. ‘All Through The Years’ has a country twang to it, and plenty of sterling synth work from Vince. Its autumnal imagery and warm tones mark this out as one of the best songs on the album, Andy bathing the track with mystery and misery with the addition of some beautiful backing vocals. ‘Blues Away’ is also one of the outstanding tracks here, a mellow soulful tune with sparse synths and a vocal from Andy delivered in a difficult falsetto while his own backing vocals cover all the mid- and low-range harmonies – he single-handedly (single-voicedly?) covers the full range without any signs of difficulty, and rightly so Vince takes a back seat on this song, although there is another great midsection that finds shards of electronics pealing off in random directions over a detuned beat. ‘Miracle’ is simultaneously inspiring and moving, a beatifully simple electropop track blessed by a harmony-filled chorus where Andy is ably aided by the St. Patrick’s choir. ‘We’ll be going home / Where the passion finds the perfect love‘ runs the chorus, sung with a melody similar to The Cranberries’ ‘Dreams’. Closing track, ‘Because You’re So Sweet’ is a sugary sweet ballad with some very meditative synthwork from Vince and an innocence and naivety that is both brave as it is beguiling. I’m reposting this review since its now twenty years since I Say I Say I Say was released. It’s nearly ten years since I wrote this review, and my opening comments about not having listened to this that much compared to other Erasure albums still holds. The album turning twenty years old inevitably encourages comments of the ‘where does time go?’ variety; for me it signifies that it’s twenty years since I went to look around the university campus that would become my home from 1995 to 1998. My family and I drove from Southend-on-Sea, where we were staying in a guest house, to Colchester to visit the university, and I insisted on playing the cassette of this album that had come out that week. Some years after I wrote this review I alighted upon an old VHS video cassette which included a short interview with Andy Bell and Vince Clarke on some Saturday morning kids’ TV show; Andy attempted to explain the title of the album using a joke. It fell flat on its face, wasn’t funny and didn’t help explain the daftness of this title. It’s always struck me as odd – this is a comparatively serious LP, but its title suggests a lightheartedness that just isn’t there in the music.